The wonderfully satirical artist, Florine Stettheimer (1871-1944), is going to have a show of more than 50 paintings and drawings, supplemented by a selection of related material, at the Jewish Museum (May 5 – September 24, 2017). Perhaps Jeffrey Deitch knew about this, which is why, for this year’s Armory Show (March 2 – 5, 2017), he reprised a group exhibition focusing on Stettheimer that he did more than twenty years ago. Stettheimer, who was one of the most interesting artists to emerge in the 1920s (along with Marsden Hartley and Stuart Davis), also ran a salon with her sisters, Ettie and Carrie, and their mother Rosetta. Marcel Duchamp, Alfred Steiglitz, Isamu Noguchi, and Georgia O’Keeffe and many others were frequent guests. A number of her paintings are in Metropolitan Museum of Art, New York, where I often stop by to see them. The dapper Deitch turned his Armory booth into what he called Florine Stettheimer Collapsed Time Salon. Behind a curtained entrance, there were hot pink walls, a couch, and end tables, along with works by various living artists on the walls. All the writers who cited Deitch’s booth predictably praised the museum-sanctioned, mainstream darlings they found there: John Currin, Elizabeth Peyton, Cecily Brown, and Laura Owens. These artists were spotlighted no doubt because the Armory Show is an extravaganza for collectors on the lookout for that special something — which Florine would have found wicked and amusing. During her lifetime, she never had an exhibition or sold her work, preferring to give things to friends. She asked her family to destroy her work after she died, but, luckily for us, they did not heed her words. I was particularly struck by the fact that no writer I came across mentioned Thomas Trosch’s paintings. Perhaps that’s because he is so good at what he does, reviewers might have mistakenly thought they were actually looking at Stettheimers. For years, he has been channeling this idiosyncratic artist, whose work was rediscovered by accident in the late 1970s. Stettheimer’s primary subject seems to have been pleasure, which for her included witty conversations at her salons. In her paintings, she synthesizes astute observation and extreme contrivance into something unique. 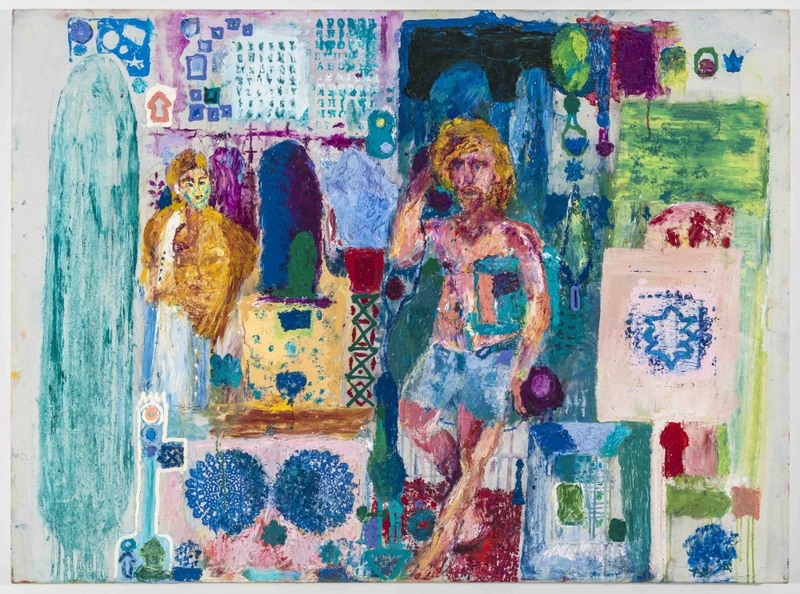 Her palette ranges from high-key to pastel, all of which Trosch pushes to the point of courting the sickly sweet, as in the largely pink encaustic, “Two Ladies” (2013). The other reason that writers might not have singled out Trosch is because he has not had a solo show in New York since 2009, which is more than a generation and nearly a lifetime in art-world years. So you can imagine my delight when I learned of Thomas Trosch: Paintings New and Old at Fredericks & Freiser (April 20 – May 26, 2017). The 16 paintings in the exhibition are dated from 1993 to 2017, which amounts to a much-deserved survey. They range in size from 12 by 12 inches to 84 by 70 inches. Trosch uses oil, often applying it in a thick paste the consistency of peanut butter or putty in florid, hothouse colors and pale, pastel hues — pinks, mauve, celadon greens, sunburst yellows, deep blues, and reds. The space is compressed, which the thick paint collapses further. In some works, the built-up areas and saturated colors might bring to mind Play Doh. Trosch’s paintings are laced with pictorial instances of satirical frivolity; they are sharp, odd, profligate, and clunky. Their counterparts in fiction would be the claustrophobic novels of Ivy Compton-Burnett mixed with the extravagant looniness of Ronald Firbank. His work adds up to a comedy of manners in which the subject includes collectors and artists. In the five large paintings in the smaller gallery, the paint isn’t as thickly applied as in the later paintings, which date from the past few years. The women, wearing poofy or bouffant hairdos, are standing or sitting around, chatting with a friend, who is sometimes male. There are cartoon balloons above their heads in which Trosch has written something dizzy they have said about art and the finer things in life. In “Musical Comedy Medley #7” (1996), we read: “Around you there lies pure enchantment in disguise” and “You’ll never grow old / and you’ll never grow poor / if you look to the rainbow / beyond the next moor.” The phrases come from the 1968 musical Finian’s Rainbow directed by Francis Ford Coppola. Yep, Coppola. In “Dorothy Rogers’ Decorating Lesson #14” (1993), a seated woman, who has not taken off her ostentatious hat, coat, scarf, or put down her pocketbook, announces at the end of a long statement about her health (“eyework” and “footwork”) that: “On the other hand I can now truly love and live happily with such non-objective contemporaries as Jackson Pollack James Brooks Riopelle and Soulages”). I take the misspelling of Pollock to reflect upon the speaker, not the artist. The yellow wall behind her and the other two at this gathering, where the woman in the middle is pouring tea for the gentleman on the right, is decorated with generic abstract paintings. Can these people tell the difference? Along with Stettheimer, who is an obvious reference point, I was reminded of Peter Dean, who was a member of the Rhino Horn group, as well as Bob Thompson — figurative artists who packed a composition with stuff and loved to jam color next to color. More importantly, Trosch implicates himself in his depictions of artists trying to please a collector. He doesn’t ignore the complicit relationship between artist and art patron. His paintings are funny and sharp, but there is nothing superior or smug about them. Stettheimer and the late-Rococo painter Jean-Honoré Fragonard have inspired his palette. The difference is that he replaces Fragonard’s painterly exuberance and delicate flourishes with a plodding awkwardness, which becomes a contradiction. Hedonism is slowed down. The people who care so much about their appearance begin to look silly. The paintings are patiently built up, with surfaces and colors that recall cake frosting, and squiggly lines made by squeezing paint directly from the tube. There is nothing hurried about them, an approach that runs counter to the self-important people he depicts, and this includes the artists. I get the feeling that as much as Trosch depicts a world he needs, he recognizes that he will never feel comfortable in it. Assimilation is not his strategy. This is very different from the tack taken by Eric Fischl, whose recent paintings of collectors at art fairs talking on their cell phones feel so false — and not just because they are so badly painted. The celebrity portraitist who now claims to be critical of anonymous collectors is a tad self-righteous, isn’t it? But, as the recent elections have proven, phoniness goes a long way in this society. That’s why I was interested to discover how many writers focused on the celebrated artists in Deitch’s booth, since Trosch actually had something very fresh to offer. That freshness is necessary to the art world’s healthiness, even if it is not fashionable.